The D739 A/T is the ultimate desert/enduro off-road, non-DOT tire, incorporating heavy-duty casing and a highly durable tread compound for rugged off-road performance. The dual-sport market arguably encompasses the most far-ranging realm in all of motorcycling. And that’s why Dunlop offers tires that can withstand the rigors of Baja racing while also meeting the needs of adventure-touring riders piloting 1200cc bikes in search of abandoned logging roads. 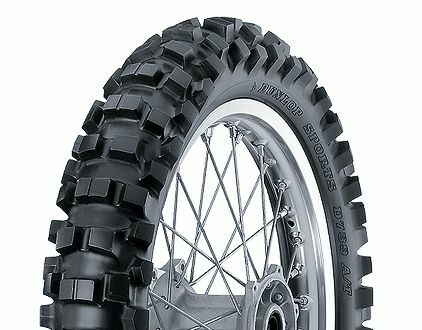 For years, Dunlop has dominated grueling long-distance desert races such as the world-renowned Baja 500 and 1000, where factory riders run our dual-sport tires at sustained speeds in excess of 100 mph. And for years, dual-sport riders also have depended on Dunlop tires for commuting, weekend sport riding, or long-distance explorations. For unrivaled performance on the street or in the dirt—or both—winners ride Dunlop. The D739 A/T is the ultimate desert/enduro off-road, non-DOT tire. Incorporates a heavy-duty casing and a highly durable tread compound for rugged off-road performance. For riders using standard-size wheels, the D739 A/T is available in a 19-inch size that also delivers rugged desert/enduro performance. The D739 A/T is designed to complement the D606 front tire for off-road riding.